Marketing used to be about finding customers. 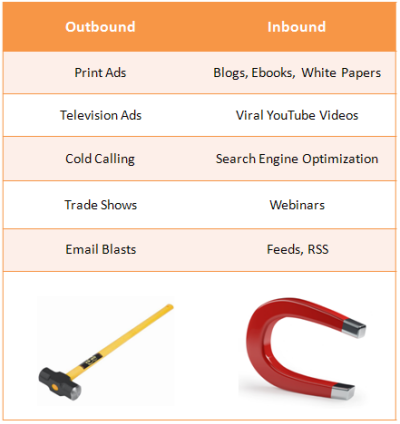 In traditional, or outbound marketing, companies use trade shows, TV, direct mail, cold calling and other techniques to find customers and pique their interest. But the marketing world is changing. Thanks to recent economic downturns, a lot of companies don’t have the big advertising budgets that they used to. Technology has also made it harder to communicate using these channels. Emails can be blocked, cold calls avoided, and people now record TV shows so they can skip over the commercials. Inbound marketers, on the other hand, create content that people want to see. Prospects will actually seek out business blogs, videos, and helpful content and tools. Instead of inundating potential customers with a strong sales message, inbound marketing entices them, and provides value in exchange for their time. Inbound marketing also offers three advantages over traditional marketing approaches: it’s cheaper, it offers more focused targeting, and, because the content you create will last as long as you like, it’s an investment instead of an expense. Living Stone can help you create compelling content that your prospects and customers will want to find. To find out how you can transform your knowledge, experience and competence into valuable content formats, such as white papers, customer references, competitive sheets and value cards, visit us at https://livingstone.eu/content-marketing/, or call us at +32 (0)55 59 10 01.